The reason policymakers may close the MPSERS defined-benefit system is to provide some containment of growing unfunded liabilities. The concern over transition costs and potential political conflict also suggests that the remedy should be worth the trouble. In that case, legislators could also consider not just closing the defined-benefit plan to new members, but freezing the benefits earned by current members. Consider, for instance, how lopsided employer contribution rates are for new MPSERS members. As Graphic 2 shows, in the coming fiscal year, hiring new public school employees in Michigan will require a school system to pay not only their salary and benefits, but also an additional contribution — more than 26 percent of their salary — into MPSERS for OPEB and pension benefits. [*],  Only 2.24 percentage points of those contributions pay for the pension benefits that the employees will earn for their work that year — i.e., the employer’s portion of the pension’s normal cost. Much of the remainder — 12.49 percentage points — will pay off previous unfunded accrued liability. [†] For new employees, then, a substantial portion of the retirement money that school districts set aside after hiring them actually will pay for benefits that other employees and retirees have already earned. Source: “Employer Contribution Rate,” (Michigan Office of Retirement Services, 2012), http://goo.gl/xDLlk (accessed March 4, 2012). GASB guidelines are not entirely clear about the preferred accounting treatment for amortization payments on the unfunded liability in a frozen-and-closed system. In light of this, the state could consider constructing a responsible but backloaded amortization schedule. The state would meet its constitutional requirement to honor the accrued financial benefits of MPSERS retirees. Ideally, as discussed under “3) Just Pay It,” MPSERS employers would shorten the amortization period to pay these liabilities down within the average working lifetime of the workers who earned benefits under the defined-benefit plan. Alternatively, policymakers could consider continuing to use a level-percentage payment method, since the only caveat GASB states explicitly for the use of a level-percentage payment method with a closed plan is that the actuaries assume a decrease in membership over time. The level-percentage payment in a frozen-and-closed system would no doubt be higher than in an open system, but upfront “transition costs” might be mitigated by payroll increase assumptions. Finally, if policymakers still decided to follow a level-dollar payment schedule and faced upfront “transition costs,”[††] they would at the same time be adopting a reform that created an even higher long-term cost containment than simply closing the plan would. MPSERS defined-benefit plan would incur no new liabilities for further service, even for current public school employees. [*] This figure assumes the employee was hired on or after July 1, 2010. These employees are part of the MPSERS Pension Plus Plan established by Public Act 75 of 2010. “Public Act 75 of 2010,”), http://www.legislature.mi.gov/documents/2009-2010/publicact /pdf/2010-PA-0075.pdf (accessed Aug. 3, 2010). [†] Kerrie Vanden Bosch, email correspondence with James M. Hohman, Sept. 2, 2011; Foss, “All Reporting Unit Business and Payroll Personnel of the Michigan Public School Employees Retirement System,” (Department of Technology, Management & Budget, 2011), 1, http://goo.gl/H4n52 (accessed Jan. 23, 2012). The other major portion of school districts’ mandatory MPSERS contribution — 8.5 percentage points — is dedicated to retiree health care benefits. These are defrayed on a pay-as-you-go basis and therefore subsidize the health costs of current, not future, retirees. [‡] Depending on when an employee was hired (and whether he or she exercised the option to switch plans), he or she is a member of MPSERS defined-benefit Basic Plan, Member Investment Plan or new Pension Plus Plan. Only Basic Plan members do not contribute to their pension. 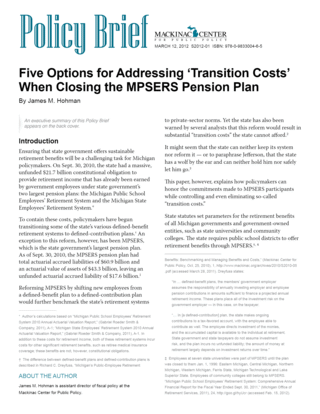 [§] Essentially, active MPSERS members pay for the majority of the normal pension costs — i.e., the benefits they are currently earning. 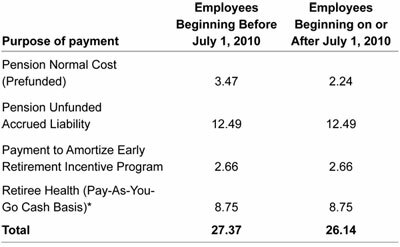 The employers pay for the remainder of those costs plus the “catch-up” — i.e., the unfunded liability — for benefits that have already been earned. As noted above, the employers also pay for retiree health care and other items. [¶] This maximum is the figure for MPSERS members who are part of the Member Investment Plan and who started work on or after Jan. 1, 1990, and before July 1, 2008. This maximum contribution is also the requirement for MPSERS members who are part of the new Pension Plus Plan. “Michigan Public School Employees’ Retirement System 2010 Annual Actuarial Valuation Report,” (Gabriel Roeder Smith & Company, 2011), F-3. [**] Some early MPSERS members are part of the system’s Basic Plan and do not make payments into the retirement plan. All other members do, however. Ibid.